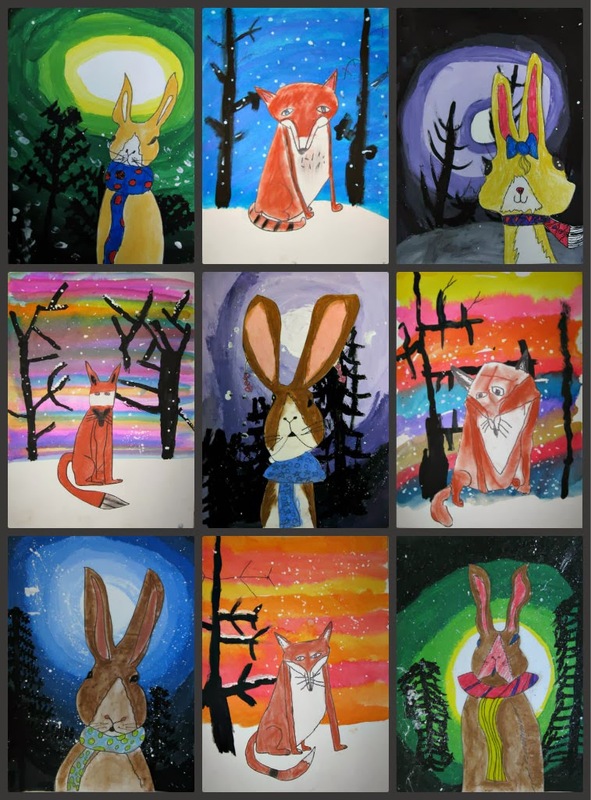 My two Winter Holiday Art Fun classes revisited a couple favorite lessons with these tint and shade rabbits and foxes with watercolor skies. They have a wonderful illustrative quality which would make them perfect to accompany a short story or a poem. 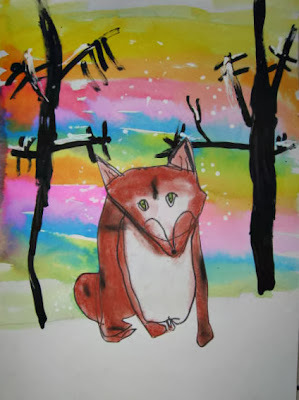 Both groups followed direct line drawing lessons to create their rabbits and foxes and shaded them with chalk pastels. 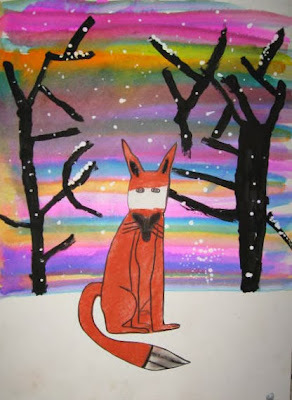 Animals were cut out and glued to winter backgrounds. I love the clear colors in the watercolor skies. Kids used careful constraint no avoid any "muddiness", Also, the touches of snow on the branches make it seem like new-fallen snow. Cool!! These are so sweet and I do love the illustrative quality! I agree with Hope!! Fantastic work....book-worthy! I love that these are also so different and so very attractive. What an inspiring project! Thanks very much for your nice comments! Wondering if possibly this could not be created using foam shapes for the animals & whatever else the children might like to do. This would then open it up for those that are younger than the probable age limited group. Could also use other things besides a paintbrush to create a very soft effect like cotton balls. I too have a BA but it is half art and half gerontology and now i work with children. Absolutely! I love the idea of switching out elements to fit different ages, needs, goals ect.. I encourage you to use any ideas as a springboard and tweak the project to fit your needs. (Love the idea of using cotton balls!) Thanks for the comment and best of luck! 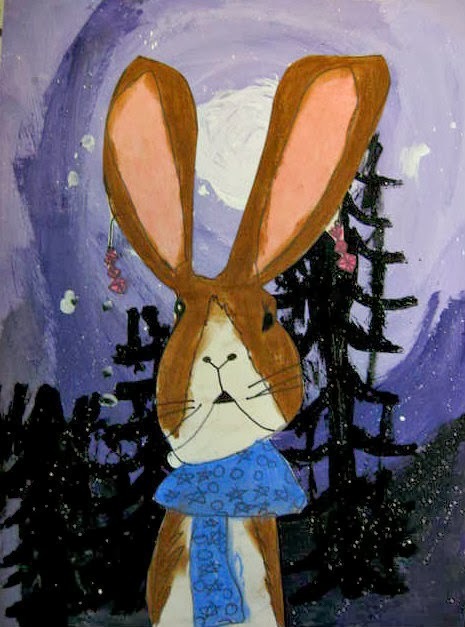 With the tints and shades project with rabbits I offered a few acrylic paint choices for the kids (purple, blue and green) I had white and black already on their palettes and just added their choice of color. With the fox project, I put a variety of colors in small amounts in each students palette but told them they didn't have to use them all. They might just want to use cool colors or warm sunset colors. You could also just limit the colors you offer to cut down on waste. The trees in both projects were painted with black acrylic paint. I gave a few directions on the white board to help the kids get started. Wonderful project! Do you cut out the rabbits for the younger kids? Wondering , did you read a particular story with this project? No story. But I think this pieces definitely lend themselves to a short story by the artists. These are so cute and creative! I would love to see if my 3rd graders would be interested in doing this project. Is it possible to send a list of materials used? And directions for the children? Hi! Love these animals. I would like to do this with my son's class. I'm a parent Art Volunteer. Can you tell me - do you have a tutorial for the fox & rabbits?